Okay something's going on here. As the second worst place to land in Fortnite just behind Salty Springs (seriously, they’re both awful and have one piece of loot to share between twenty people), Fortnite’s Pleasant Park isn’t everyone’s favourite landing spot. Now it looks like there may be more reason to land here with underground lairs popping up, much in the same way that happened to Salty all those seasons ago. 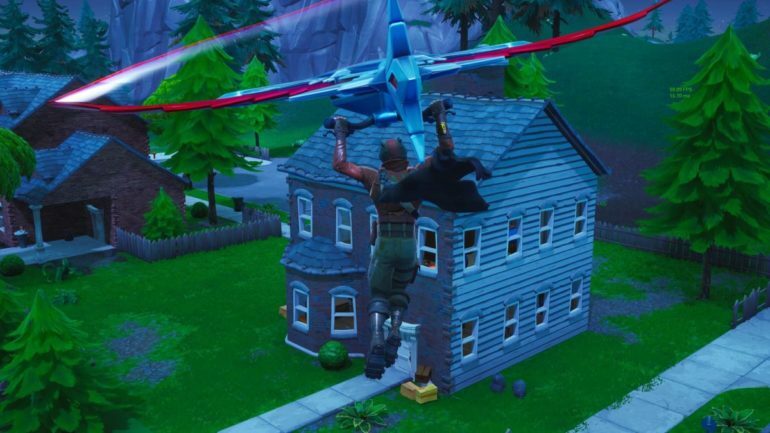 If you go over to the most useless house in Pleasant Park, basically that one that is like an inch big and never has any loot, and make your way under its stairs and break the debris, you will be able to go down some stairs, just like the blue house in Salty. From there, make your way over to a fractured wall, break it down, and then go through the industrial door to end up in the secret Pleasant Park bunker. There’s some decent loot in here: I found three chests in total, which is about par with the Salty Springs equivalent bunker. This is just one of two bunkers in Pleasant Park, there’s also another one adjacent to the broken house on the west side of Pleasant. That’s not all: there’s one in Retail as well. This, combined with the Loot Lake bunker that’s hard to miss, makes us think that we might be having another visit from The Visitor or something before long. This is very reminiscent of an earlier season, so who knows what’s going on in Fortnite. Elsewhere in the Fortnite v8.40 update, we’ve have a good look at the leaked skins that will be coming soon, as well as a bunch of changes include the ability to copy emotes.